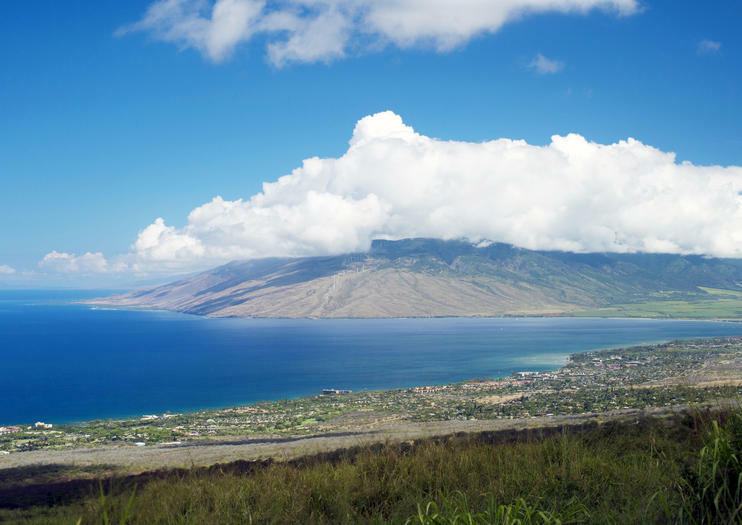 Most Maui visitors will spend some time at Maalaea Harbor, the launching point for many of the Island’s best sunset and dinner cruises, fishing charters, snorkeling adventures to the Molokini Crater—a submerged volcanic crater atoll—and more. The 89-slip harbor is the focal point of a quiet bay in the southern nook between the West Maui Mountains and towering Haleakala. Between late November and early April, head to the scenic lookout between mile markers 8 and 9 to the west of the harbor for sweeping vistas of leaping humpback whales, or any time of the year to spot the dolphins that sometimes ride waves alongside harbor-departing cruises. The Pacific Whale Foundation, organizers of the annual World Whale Day celebrations, have their headquarters in Maalaea Harbor for a reason. Have some time to kill while waiting for your boating adventure? Set back from the sea is the popular Maui Ocean Center, an aquarium highlighting Hawaiian sea life from sharks to sea turtles, corals and more in over 60 indoor-outdoor exhibits. Or, grab some award-winning barbecue from the Beach Bum's Bar & Grill then explore the strips of adjacent Harbor Shops. Maalaea Harbor is located at 101 Maalaea Boat Harbor Road, a 10-mile straight shot south of Kahului across the Isthmus. The Maalaea Harbor shops are open daily from 9:30am until 9:30pm and harbor facilities include restrooms and showers. Each boat is individually operated, but most sell tickets at the Maalaea Harbor Activities booth dockside near slip 47 between 9am and 8pm. For the best chance of spotting wildlife opt for a boat departing the harbor early morning. Because of the lay of the land here, funneling down between two mountains, it can be quite windy—hold onto your hat when the local trade winds pick up midday.